Alan Macro, Councillor for Theale on West Berkshire Council, is fighting a near 60% increase in bus fares that would affect many Theale residents using the popular JetBlack 1 service. The hike is the result of moving the boundary of the simplyReading flat fare scheme from the edge of the village to its centre. Councillor Macro said "Reading Buses are moving the flat fare boundary from the Wigmore Lane bus stop to the stop at The Crown. This increases the single fare for travelling between the affected stops and Reading from £1-90 to £3-00. To travel from those stops to Sainsbury's at Calcot increases from £1-20 to £1-90. Reading Buses have told me that this is to help pay for an additional bus on the route and to make up for reduced payments from West Berkshire Council for use of pensioners' bus passes. It is very unfair to ask Theale residents to pick up the tab!" Councillor Macro has set up an on-line petition against the big rise. Readers can sign it at www.theale.org.uk/bus-fare-petition. I'm raising a petition asking West Berkshire Council to urge Reading Buses to reverse the simplyReading fare boundary change that increases fares by 60% for many Theale residents. Please sign the petition and pass it on. A resident alerted me that Reading Buses are changing the boundary of the simplyReading fares and that this would mean that fares for many Theale residents travelling into Reading would jump from £1-90 to £3-00 from 1st September (thank you, John). The change will mean that passengers sing the bus stops between Wigmore Lane and The Crown would have to pay nearly 60% more. Unfortunately, West Berkshire Council have no say in the matter as the Jetblack 1 is a "commercial" service. I have written to the Chief Executive of Reading Buses asking him to reconsider the change. I have also started this petition against the change. Theale children are really enjoying the new skatepark! Planning application 14/01322/OUTMAJ to build 10 flats on the Theale Motor Works car sales site is being withdrawn. This is the old filling station site at the corner of Church Street with Station Road. The applicant has told me that he will submit another planning application after discussions with West Berks Council planning officers. However, it will take some time for the turf to get established. The security fencing will therefore be taken down in time for the skatepark to first be used next Saturday (23rd August). The parish council asks that everyone respects this. The skatepark will be officially opened by a "celebrity" at a later date. I have been hearing rumours for a while that the IKEA were planning to reduce the height of their planned store in Pincents Lane, Calcot, by one floor. This has been confirmed this week by this article in Retail Week. It will involve a 13% reduction in floor area from 38,000 square metres to 33,000 square metres. IKEA expect to submit a new planning application to West Berkshire Council in the autumn. The reduction in height should reduce the impact of the store as seen from Theale, though we will have to wait to see the new plans to be sure. IKEA have not said whether they are expecting fewer customers, though the article says "The move reflects the growth of online shopping and also consumers’ desire to shop more conveniently." Fewer customers would, of course, mean less traffic. I am worried, though, that IKEA may want to reduce the amount that they pay towards road improvements as a result of the reduced size. I have submitted the following comments on the four "preferred option" sites for housing that West Berkshire Council is proposing to allocate around Theale. I have also written these comments supporting West Berkshire Council's rejection of the White Hart Meadow site. I suspect that the owners of this site will try to get the site back in. I've updated the theale.org.uk website to include more information on how to have your say on West Berkshire Council's proposals to allocate four sites for housing around Theale. I've created a new page: www.theale.org.uk/consultation.html. I have written to the head of Highways on West Berkshire Council asking him to either have the grass mown more frequently or have the problem section paved so that grass does not grow there. I see from an article in the Newbury Weekly News that you are to have a meeting with the Leader and the Chief Executive of West Berkshire Council to discuss the Pincents Hill site. I would be grateful if you could also discuss the four "preferred option" sites around Theale. These would total up to 313 homes. These, together with the 350 homes given permission on the Lakeside site, the 44 already under construction, the 20 that are the subject of planning applications and the 26 proposed behind the High Street, would increase the size of the village by almost 64%. Theale will remain a vibrant village which maintains a distinct identity and sense of community. The Lakeside development has planning permission to provide 350 homes in a range of different sizes and types, which would become a well integrated part of the Theale community. 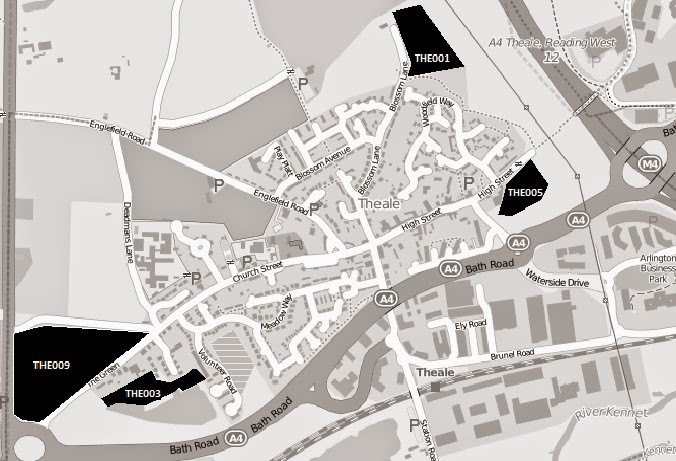 If this development goes ahead, Theale would need to undergo a period of consolidation to provide an opportunity for facilities and services to be upgraded. Many Theale residents are extremely concerned about the effect such a large amount of housing would have on the character of Theale and on services such as the GP surgery, Theale Primary school (already full) and on the sewerage system. The map below shows the location of the four sites. More information on them can be found on my Theale website. I have "called in" the planning application for the Red Lion pub in Theale to be decided by West Berkshire Council's Eastern Area Planning Committee (most applications are decided by Council officers). The application is number 14/01696/FULD and is to convert the pub in Church Street into a house and replace its skittle alley with an extension of eight flats. You can view the plans, etc., by clicking here. Anyone who objects to the application will be able to speak to the committee for a total of up to five minutes. It would be a good idea to decide on one or two people to speak. The parish council, the applicant, and anyone who supports the application, will also be able to speak to the committee for five minutes each. Anyone who wants to speak will need to inform the Council's planning department before 4pm on the day before the meeting. I will post another blog entry when I know the date of the meeting and the committee site meeting (which is normally one week before the committee meeting).